It was a slow low start today! Oh, I woke early as usual, well most of me did. My left arm had other ideas. The fingers were curled into the palm. From shoulder to fingertips was swollen and frozen solid! My arm felt like a tonne weight and looked like marble. I thought I actually had a good few hours rest last night, I suppose now I can say I went into a dead sleep (Dublinese for heavy sleeping)! CALM DOWN everyone! I am well used to this happening…. but this is the first time it happened on the left hand side of my body. It is more usually the right side. It has gone on for years. I remember waking at times to find Jack trying to massage some life and warmth into my right arm, and that was at least twenty five years ago. I remember in the early days of our marriage, Jack saying to mammy that I had frightened him the previous night (OK, so I am no beauty with or with out the face paint. I did tell you my brothers said I looked like the back of a bus!). The cause of Jack’s fear was that he could not see, hear or feel me breathing. Mammy assured him that I was like that since I was a child. She added that she often held a mirror to my face to see if it would steam up with warm breath. It did…. just about! Over the past month my blood pressure has been jumping about like a yo-yo! Way up one week and at rock bottom the next. Latest is 100/58. So this morning in the Post/Mail I find a letter inviting me for two appointments at the Health Centre, the Cardiac Department were after me! The word has travelled from one place to another and they want to check if I have a real or a wooden heart! If you don’t hear from me…. ENJOY the party! This entry was posted in Health on May 29, 2010 by Grannymar. Our Loose Blogging consortium includes Anu, Ashok, Conrad, Gaelikaa, Ginger, Judy, Magpie 11, Maria, Ramana and yours truly. Each of us when available will contribute a piece for the topic for the week. The call of work, study or family concerns, often prevents some members from taking part on the day or indeed the week in question. This weeks offering was chosen by Magpie 11. Voices I recall are the ones that visited our fireside in the era before we had TV. – An aunt and uncle who sang all the duets from the Musicals… Numbers such as Indian Love Call from Rose Marie, I’ll See You Again from Bitter Sweet, This is My Lovely Day from Bless The Bride, Till There Was You from The Music Man and This Is My Beloved from Kismet. – Gus and Nora who sang for Ireland at every opportunity, until the bed went on fire! (Nancy you will need the tissues again!). Iris Williams spent her earliest years in a children’s home in the Rhondda Valley of Wales. She left school at fifteen to work in a glove factory. It was a very simple start in life. . . but she had a love which turned into a passion, which turned into a career…. that love was music. Iris could sing… and spent many hours in Wales singing in church choirs, and eventually, with the help of several people in the valleys, in particular, Iris Llewellyn, (her music teacher) she was awarded a scholarship to the Royal Welsh College of Music & Drama. Iris returned to the RWCMD in 1996 to be honoured as a Fellow of the College. In the New Year’s Honours List 2004, Iris was awarded an O.B.E. for her contributions in the field of music and for her services to charitable institutions around the world. In 2008 Iris was awarded the highest honour presented by the St. David’s Society of New York ~ the William R Hopkins Award for her contributions in the field of music and charitable institutions around the world. Also, that year Iris was made an Honorary Member of the Treorchy Male Voice Choir, a rare honour since Iris is the only female Honorary Member of a Male Voice Choir in Wales. For someone who had such a difficult start in life, Iris has given so much, and delighted so many. Yes, she’s come a long way, and the concerts and other appearances plus her charity work shows no sign of abating. Her recording of He Was Beautiful, earned her a gold and platinum disc, and an invitation by HM The Queen to perform at her annual Royal Variety Performance. 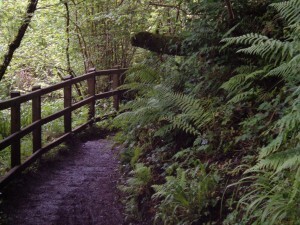 This entry was posted in Loose Consortium Blogging, memories on May 28, 2010 by Grannymar. 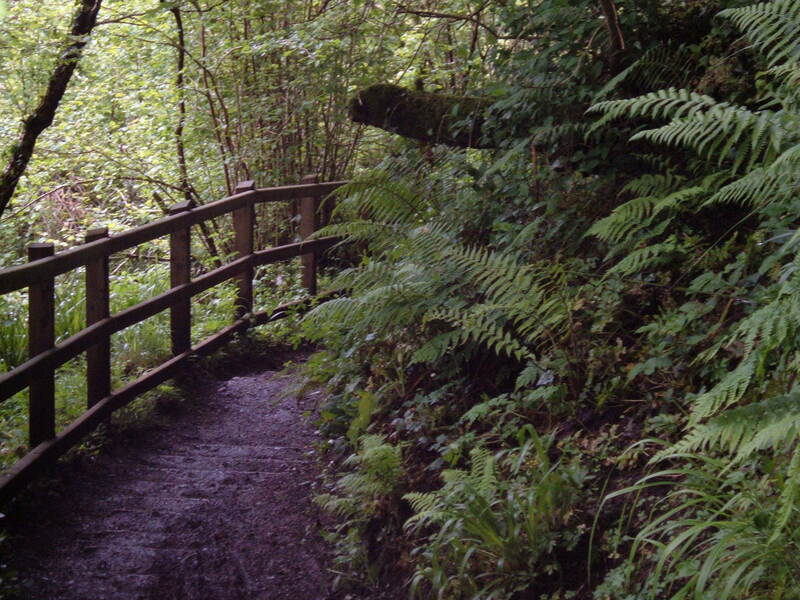 A walk at Cavehill Country Park above Belfast Castle, the photo was around this time of year in 2005. Now I am off for a walk…. See you at 3pm. This entry was posted in Photography on May 28, 2010 by Grannymar. A beautiful blonde woman driving down the highway sees a man crying on the side of the road and pulls over..
She steps out of the car and asks the man what’s wrong. Ten feet away the rabbit stops, turns around and waves again, he hops down the road another 10 feet, turns and waves, hops another ten feet, turns and waves and repeats this again and again and again, until he hops out of sight. This entry was posted in humour on May 27, 2010 by Grannymar. Sorry teacher! I do not have any homework to hand in today….. If I manage to finish it (or even get started properly) I’ll up date at the end of the day. Did I put you off the scent? I gathered my ingredients bits and pieces and sat down with the thinking cap. 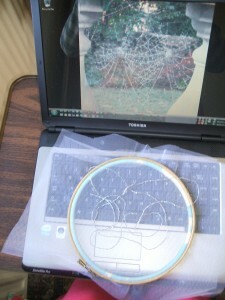 I first thought of working on tulle pulled taut in a frame. 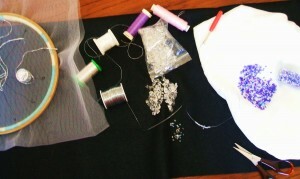 Tulle, threads, beads and beading wire. 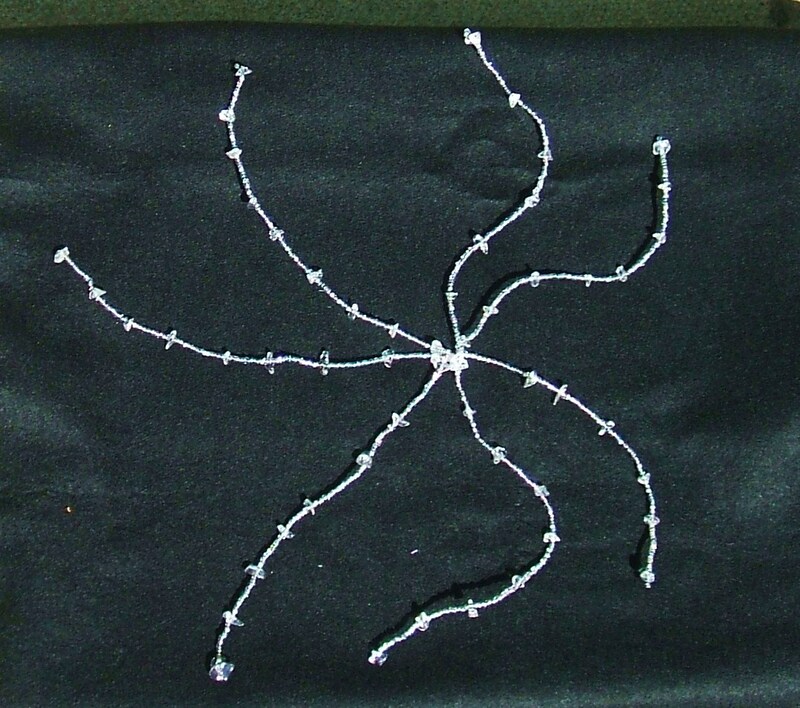 Then I thought why not just use the beading wire and beads.. I set all I needed on a knee tray and went to enjoy the sunshine! 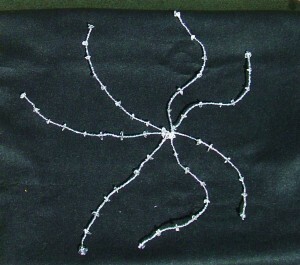 Beaded veins to provide the frame work for the web. That is as far as I managed today since I had to go out for a couple of hours. 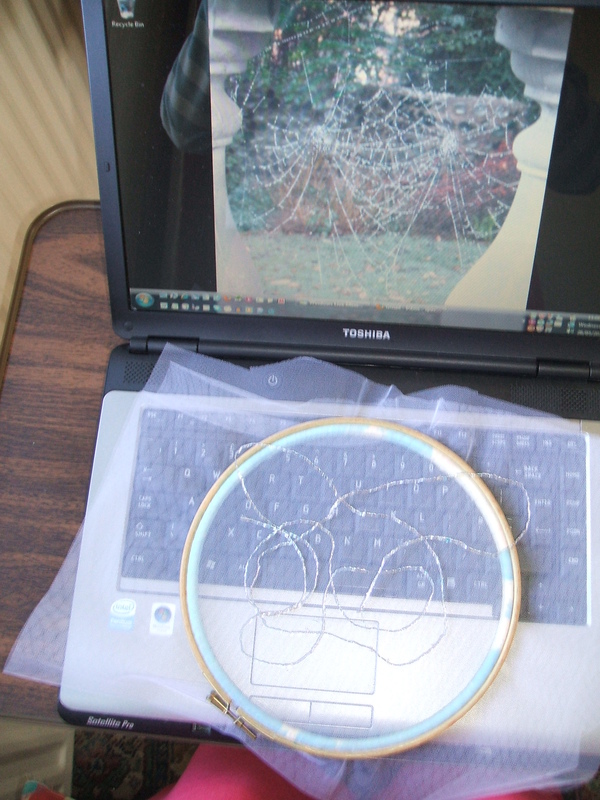 Hopefully this spider will have the finished article for you next week. I suppose you want a spider as well…. This entry was posted in Crafts on May 26, 2010 by Grannymar. Back to the Domestic Science kitchen this week for tales of how we were taught to cook. Last week you saw the ‘bible’ we used for the full five years. By the time you take away the school holidays, the term lasted for roughly nine months. Cooking for 36+ weeks a year multiplied by five and we still didn’t cover all the recipes in the book. In part two you had plenty of details of the type of recipes we were asked to produce. Part one covered the wonders of sewing! As I said before Domestic Science was considered a very important subject for young ladies about to embark on the adult world in the early 60s, they needed to be able to run a kitchen and feed the world. Who was it said “The way to a man’s heart was through his stomach”? Hmmmmm! So for 90 minutes each week I stood alongside my pal N as we chopped, stirred or mixed the chosen ingredients for the day. We had no input into the choice of what we made. At the end of each class Sister Mary Josephine of Fright wrote on the blackboard the title of the recipe and the page number for the next week. My very first session was making Rock Buns! No, they were not heavy like rocks, more like blobs of scone mixture with raisins in! Suitable for same day eating with butter or jam and mine did not make the tea table…. hungry hoards called brothers devoured them when they arrived home from school. Now you must remember that I started my cooking very early. Mammy was ill on many occasions. So, as the eldest girl I was expected to take her place and prepare, cook and serve the food to my father, brothers and my sister. It was expected on the table at the usual times and to be the same standard as mammy would produce. My early lessons in those days at home involved mammy giving me instructions from her bed. “I think you should start peeling the potatoes and vegetables now” or “Light the gas oven to reglo 5 now, so that it will be hot when you are ready to put the dinner in”. I made soups, stews, roasts as well as cleaning out chickens & turkeys before cooking them. I boiled hams, grilled fish and much more; all learned by the up and down stairs method. The baking of bread and cakes were familiar, all experience gained from mammy’s side, so the school kitchen held no fears for me. With baking every day, mammy bought large quantities of the various flours, wheatenmeal, sugar etc. The flour bags weighed the equivalent of 2kg. We worked in old time – lbs and ounces were our usual measures. We carried all our own ingredients to school each week plus a suitable container to take the finished item home again. School was a twenty five minute walk from home and there was a bus service that came once every blue moon. Even in the rain it was quicker to walk. So on ‘cookery’ day I headed out looking like a Sherpa ready to climb Mount Everest, with my bag of cooking gear and the bag with normal school books as well! I am sure that by the time I have school going grandchildren they will skip along to school with all they need on a memory stick! Sister Mary Josephine of Fright expected us, no demanded that we bring in our ingredients in the bags with the brand name on. How ridiculous was that. Imagine me carrying a 2kg bag of flour so that I could weigh out 175gms or at most 250 gms. So I rebelled! I weighed out my ingredients at home and put them in plastic bags. I even broke the eggs into a jar with a tight lid – less chance of an accident. Sister Mary Josephine of Fright had a fit, but I said that mammy needed the rest to bake with that morning. Then there was the day of the stew! We were to make Irish stew. Gigot chops, onions, potatoes and parsley & thyme, pepper & salt and that was it! All good heavy ingredients to carry. Mammy had the bright idea! “If you are making Irish stew, sure you might as well cook all of the meat and save me doing it at home”! So old muggins here, hikes up the road for twenty five minutes with half the butcher’s shop on my back. Thankfully we never got round to a grilled pork chop, or I might have had to carry one of these. Well now you guessed it. We needed the salts…. smelling salts for Sister Mary Josephine of Fright when she saw the mountain of meat I was preparing for the pot. “Are you feeding an army”? she asked, as she passed my desk. My partner N had to stamp on my foot to stop me saying that “No, it was just a snack”! We didn’t have fancy snap lock boxes back then I had a saucepan to carry the stew home in. It would be the one day when Eddy the messenger boy from the grocers was riding by on his bicycle. He stopped and offered me a lift. Where was he going to put me? Did he really expect me to climb into the great big basket on the front and balance the great big saucepan of stew while he waddled from side to side on the bendy road? Can you imagine the blue moon bus passing by with all the girls waving and laughing at me in Eddy’s basket, well there was no way I wanted that, so I declined! The baking had its moments too. Our dear teacher was not familiar with the preheated oven. She would light the gas ovens just as cakes were ready to go into them. I carried home a flop or two and mammy was annoyed at the waste, she knew I could bake because I regularly did so at home. We talked about it and she suggested that I carry a box of matches and just light the ovens when I went into the class so they would be at the correct temperature when our baking was ready to be placed on the shelves. I was in trouble for that. I was in trouble for separating eggs for half the class. We had two fancy egg separators for the whole class. We never bothered with them at home. Our method was to crack the egg on the side of the bowl and then break it in two halves, carefully switching the yolk from one half to the other allowing the white to fall into a small bowl. I had completed the task for most of the class before the first two people had used the fancy gadgets. Sister Mary Josephine of Fright actually asked me who was running the class that day. I was only helping my mates to speed things up. The next week the wheels turned…. one of the girls at a table in front of me was to cooking; what I was to maths (though now I believe she is a Cordon Bleu cook!). We were mixing some kind of cake – which one I do not remember. We never had a proper demonstration for anything, since Sister Mary Josephine of Fright never made anything herself, she would float about the class and choose to stop at a desk and call us round to watch as she took over someone’s bowl or what ever and give it a stir while explaining what to do next. I saw her face as she glanced at the table in front of me. “What is that supposed to be”? she ask the girl as she half heartedly moved the spoon through the revolting slop. Totally at a loss, she turned to me and said “See what you can do with that”! The mixture was far to wet, so I was able to adjust it and save the day. The year before I started at the school the senior class made Christmas cakes. They all burned! The oven temperature was wrong. So every year from then on the cakes were mixed in school, carried home in the raw state, baked and returned the following week to begin icing them. Another year the school was broken into on the night before the cake display. The cakes were set out and ready. When the nuns arrived in the morning the caked were smashed and thrown about the room. So by the time I was due to make a Christmas cake in school we carried it to and from school at every stage of making and decorating. It travelled that much it nearly needed a passport! This entry was posted in memories on May 25, 2010 by Grannymar. Yesterday I met one of my Toyboys. He was struggling home with a bag of charcoal. “We are going to have a BBQ!” he said. “That sounds like fun”, I said. Quick as a flash he asked “Would you like to join us”? Now this was a tricky one and needed careful handling. “Thank you for inviting me, but there may not be enough food for everyone” after a pause I added “I’m very hungry and if I eat your share….. then you would have to go hungry”! “OK! I’ll see you tomorrow!” he said, then struggled off to catch up with his dad. He was all of SIX! This entry was posted in Uncategorized on May 23, 2010 by Grannymar.